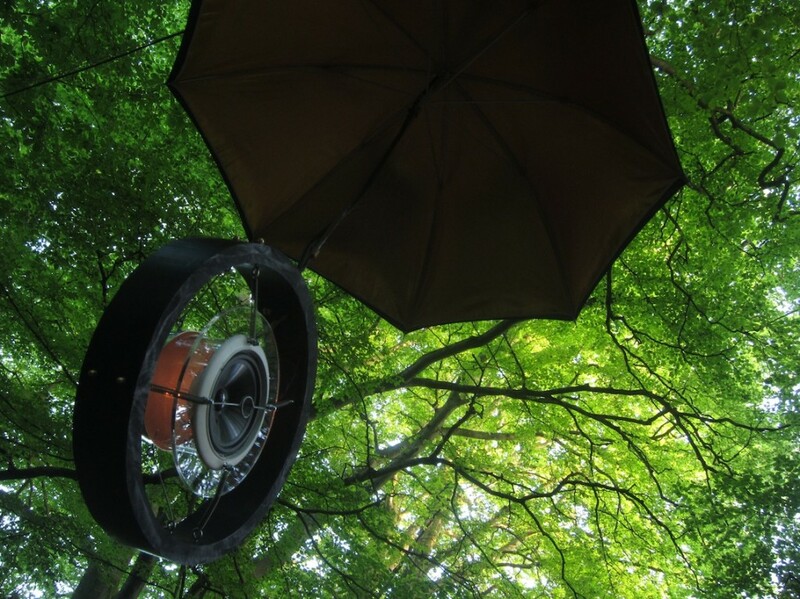 The Speakers is a site-responsive installation & construct, designed to inhabit public spaces and give voice to the unspoken, in a local vernacular. 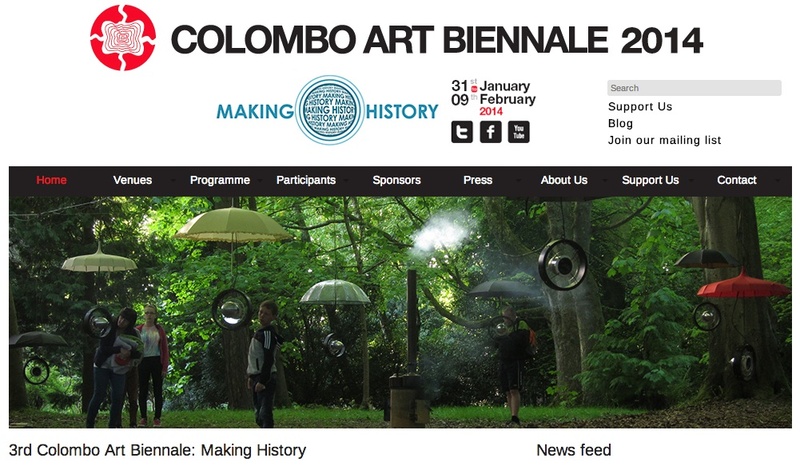 Touring Internationally across Europe and as far as the Colombo Art Biennale of Sri Lanka, it is an ever evolving entity. Each incarnation draws in content from the hypertext of people speaking-out to the world on-line, selected as relevant to each new location and time period. 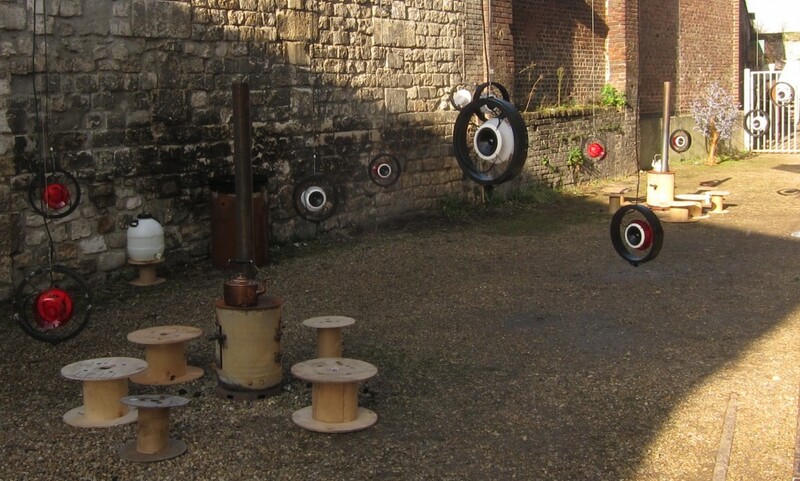 These harvested ‘words’ are then spoken by local voices, which are then cyphered through the installation. In addition we also ask visitors to participate via a question posed in-situ, answered via hand-written tags hung in the space and in-turn spoken into the mix. – Each manifestation adapts to a specific site, collectively offering a place to gather and to explore new narratives between the meta-threads, and the role of public space for us. An INSITU commission under the European framework META. 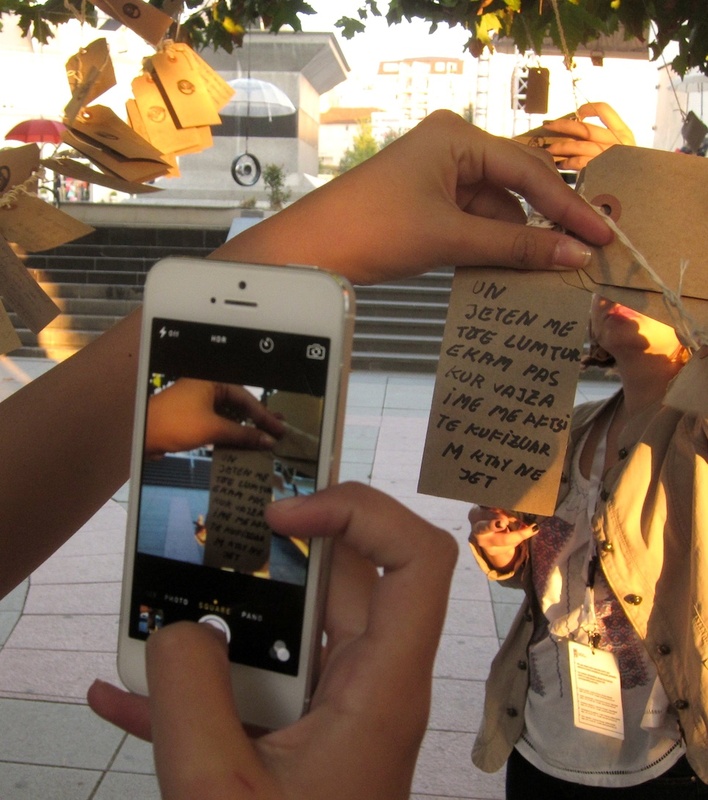 The project evolved from the INSITU & ZEPA commission Boiling Point (2012 ), with R&D funding from WithOutWalls (WOW), which focused on Tweets sent from the revolution in Tahrir square. • Freedom Festival. 2-3rd Sept. The English Premier! of this widely international touring piece. Partnering with WISE, Open Doors Centre and local Poets & Writers. Many thanks to gorgeous contributions from: Mehdi, Sadam Aldoom, Biniam Testamicheal, Michelle Dee, Catherine Scott, Robert Eunson, Julie Corbet, Audrey Fosu, Miranda van Rossum, Richard Harries, Joe Kriss (A Firm of Poets) and Holly McNish & Zena Edwards! • Zat Festival Montpelier 8-10th April. In partnership with La Boutique D’Ecrtiture and Lieux Public (Marseilles). Inc words & voices created by local writers and Refugees attending the amazing national centre for creative writing La Boutique D’Ecriture. 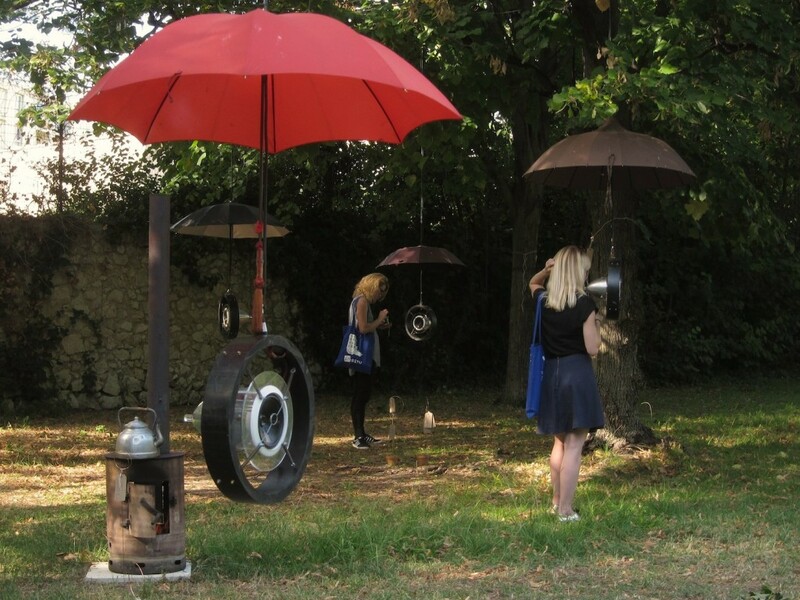 • 9-12th Sept 2015 Kosova’s inaugural festival of Arts in Public Space HAPU Festival, (Teatri ODA ), Pristina, Kosova (INSITU). Located right next to the PM’s office & behind Skendebeu’s (nat hero) statue, central Pristina. 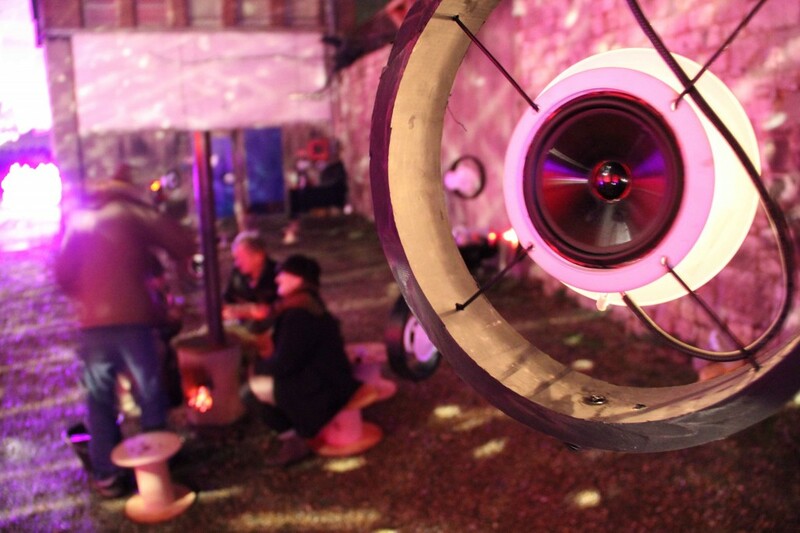 About: “The Speakers is both a process of engagement and a physical installation. The installation is designed to occupy a public space, and temporarily transform it into a kind of worm-hole between peoples and spaces, real & digital, past and live, local and global. 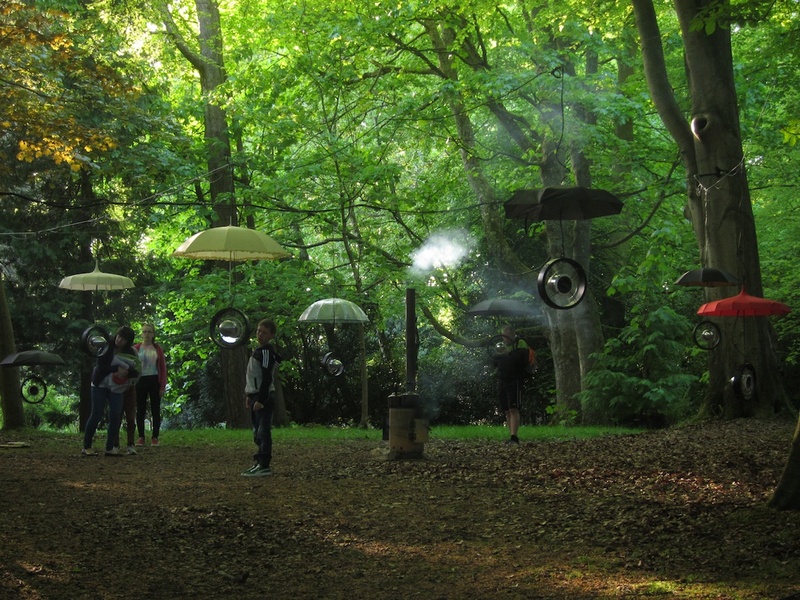 The installation takes the form of: a flock of suspended physical ‘nodes’, each hanging below an umbrella, each emitting a different human voice ‘speaking’ a spaced string of Tweets and Blogg extracts. Each voice also pulses with light. We are invited to walk within them, collaging between and or focusing in on individual sources. The flock gathers around wood burners, which heat kettles of fresh mint tea.. we too are encouraged to ‘gather into the fire’ and listen to this cloud of evolving stories and reports.. 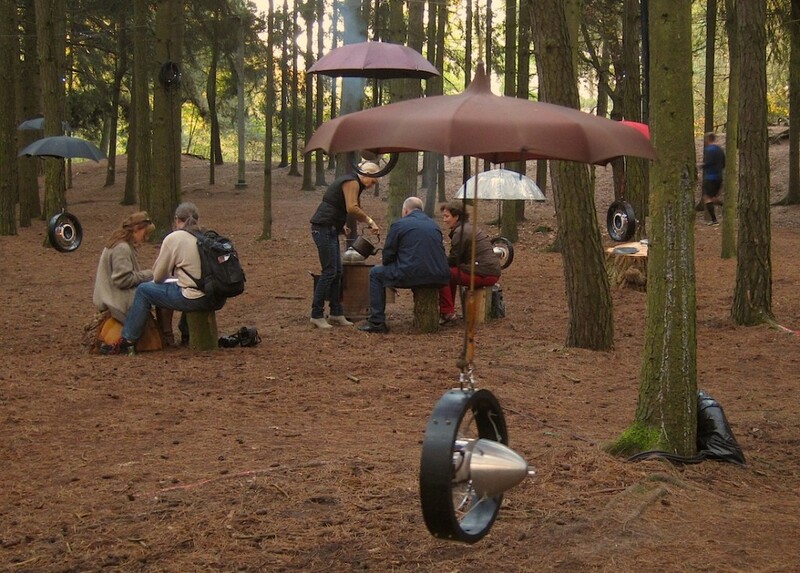 The Speakers offers both a simulation of and stimulation for people to gather. The project looks at the increasing ways in which we cypher and share our very ‘real’ lives and experiences through digital and ‘unreal’ text. 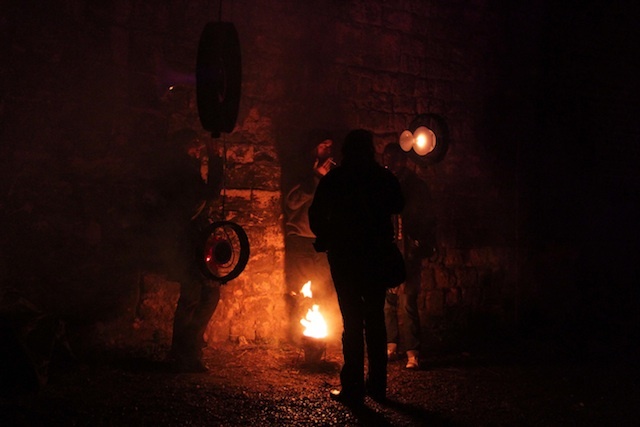 – for instance how a young woman amid teargas-soaked-streets of a revolution, condenses and describes her visceral experience into a Tweet – The Speakers then gives-voice to these ‘texted’ and disembodied words and re-roots them in a very physical, local and multi-sensory experience.” – Thor McB. 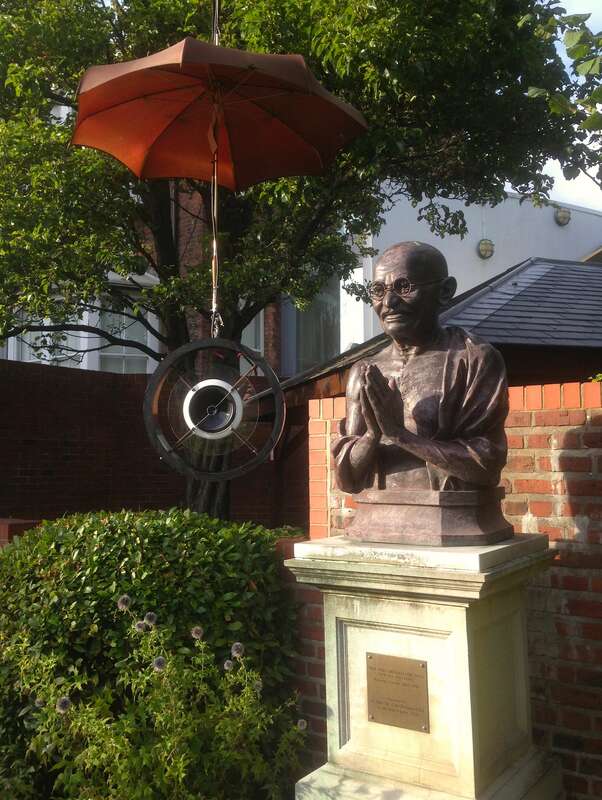 Commissioned for the Colombo Art Biennale 2014 in the grounds of the Goethe Institute. -Incorporating Sri-Lankan voices, materials & references, drawing in coverage of the #Weliveriya water riots gathered in collaboration with the human rights organisation Groundviews. ** A series of new sculptural designs were developed here, during a 1 month (INSITU funded) Residency @ SuraMadura, Sri Lanka. 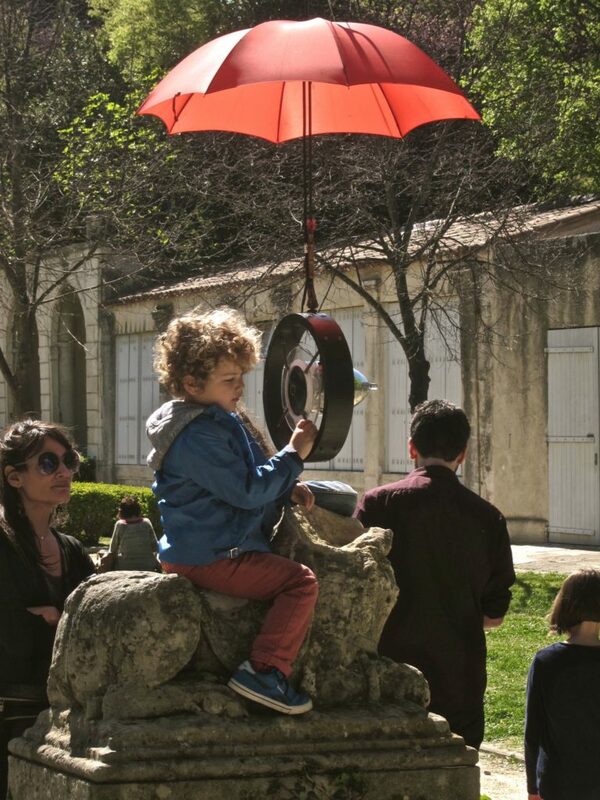 Invisible Walls Int Conference – by Lieux Publics & In Situ – Marseilles 3/4 Oct 2013. 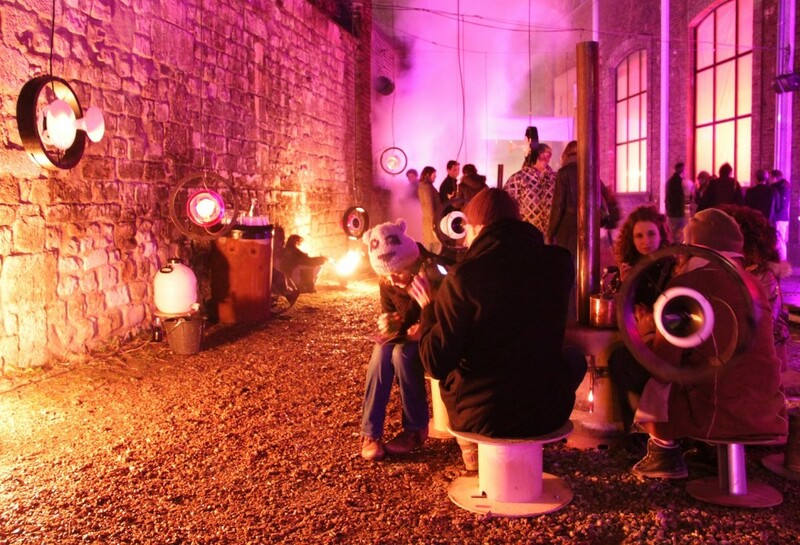 – 200 artists, elected officials, and thinkers discuss public space in Europe! 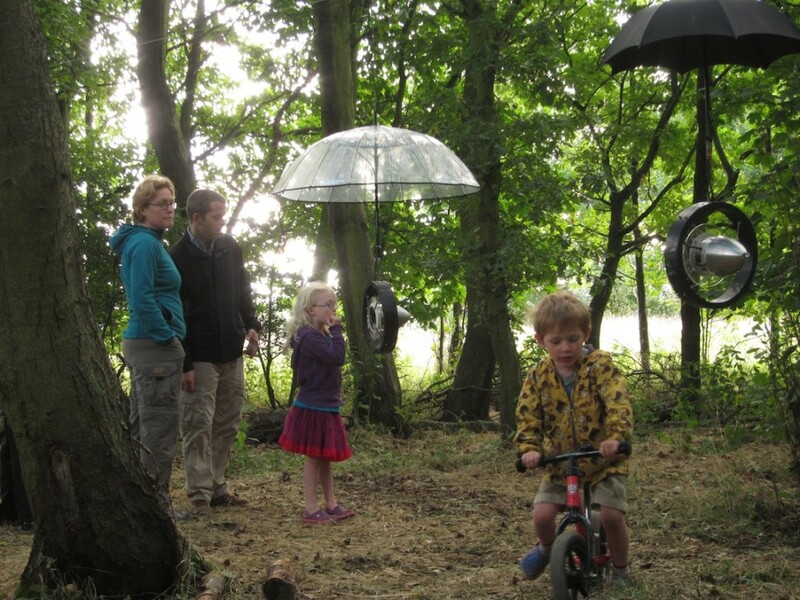 I have been invited to deliver a talk about the project as part for the Invisible Walls Conference on 4 Oct 2013, using it as a case study for discussing the role of artistic interventions in Geopolitics in Europe today. – I invite you to come! Its fantastic forum for discovering whats cookin’ on the street in the EU. May 2013 The Speakers on Ayr. @ Burns an’ a’ that! Festival ( UZ Arts and INSITU EU network commission). incl: New 3D Design; Advanced Rigging System and trial working with Both Archives of Non-Digital Text Juxtaposed with Tweeted Texts: – I.e. Here Robert Burns Revolutionary Writing & Prose (C18th) ‘v’ Tweets sent from Revolution in Tahrir (C21st contemporary form of revolutionary writing). Both Burns Night & Egypt’s Revolution share Jan25. Also ‘re-speaking’ Tweets from Tahrir in a local Scottish vernacular. 14th Sept 2013. Helix Day, Falkirk, Scotland (UZ Arts and INSITU EU network commission). New Partners AudioBoo have come on board and the project now has its own Channel on Audioboo to Record, gather and collate the recorded voices. -This will provide both a Tool and a online Platform for this project. We are working with a local Forth Valley Sensory Centre which serves this area of Scotland, and a Visually Impaired (VI) and Blind group. They’re contributing their voices to the project and piloting how this project can draw on VI perspective and explore Audio Description as an art form. Some pics below (video coming soon)! 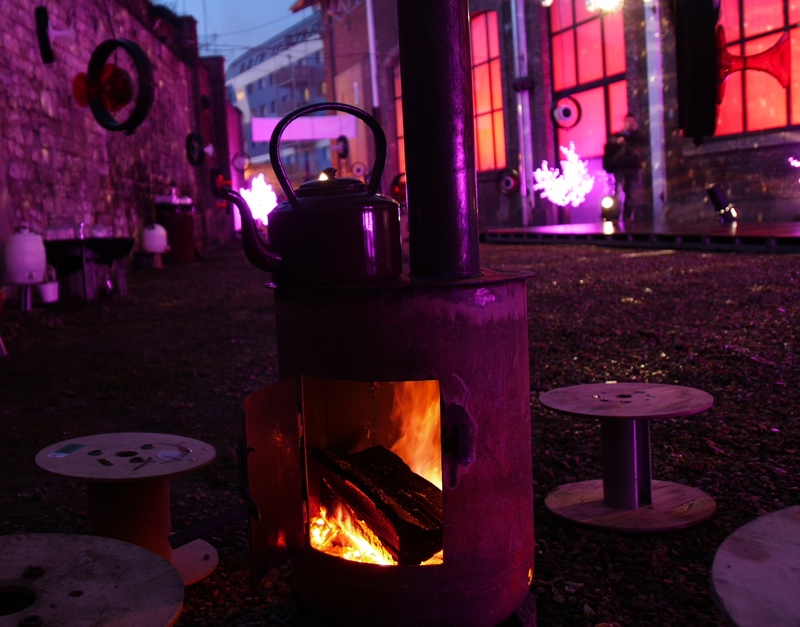 The project Boiling Point* was first made manifest in Jan 2012, to mark the Anniversary of Egypt’s Revolution in Tahrir Square and in response to Atelier 231‘s** history, the birth place of Europe’s Industrial Network Revolution via the Steam Train (** Atelier 231 @ Rouen’s Train Depot, built Boilers for the infamous Pacific231 Steam Train and now runs one of Frances largest Street Arts festivals Viva Cité.). *More info on Boiling Point further below. 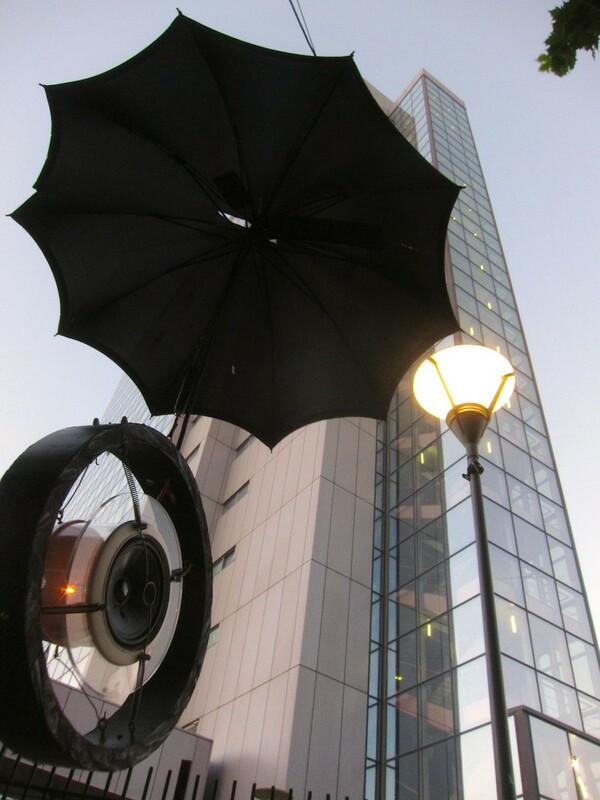 The NEXT PHASE of this project Boiling Point evolved into the new concept The Speakers, via R&D funding from the British consortium of Street Arts Festivals With Out Walls and the EU Culture Program project City Noises (linking London, Helsinki, Budapest). 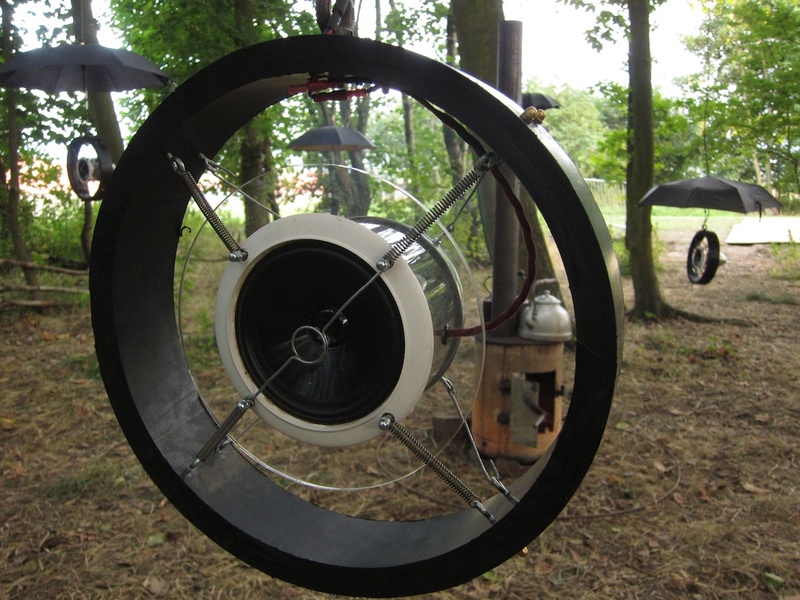 The Speakers will be developed with partners in the UK and EU, in phases over 2013 to become a tourable beast for 2014. 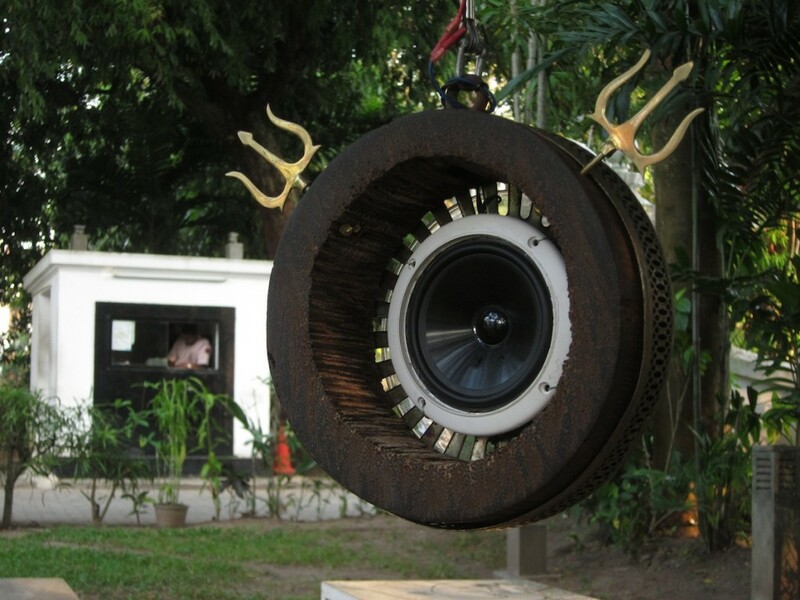 THE SPEAKERS.. – Prototype v2. 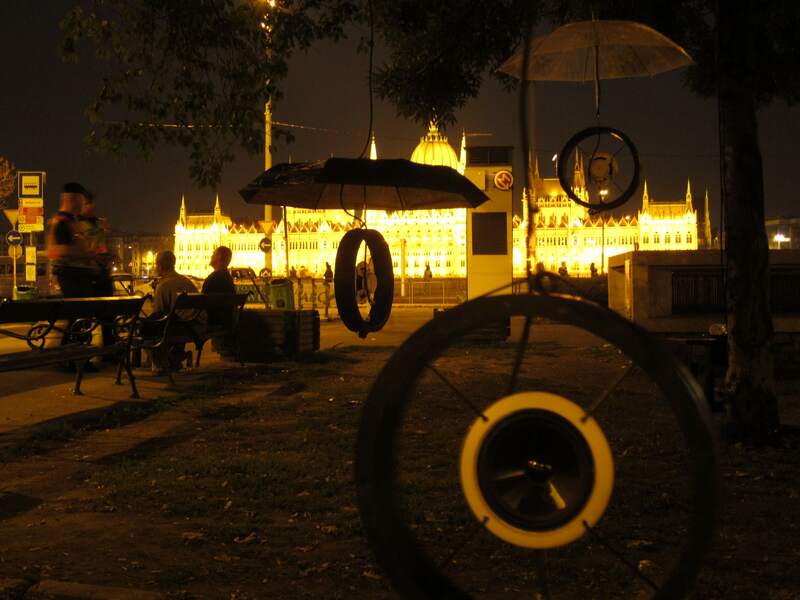 –Pilot Manifestations in Budapest as part of EU partnership City Noises & INSITU @ Placcc Festival Sept 2012. 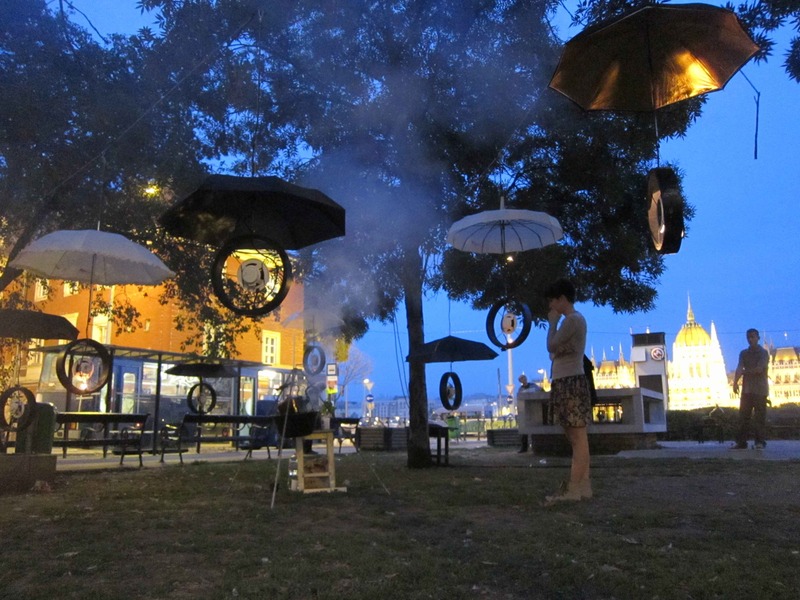 In the last week of September a small sorté of ‘The speakers’ manifest themselves in 2 locations in Budapest: Batthyany Square, bang across the Danube from Parliament (as a part of City Nosies) and also behind the old Merlin theatre in downtown Pest (as part of the INSITU meeting). Batthyany square was a bizzaar and brilliant location, with the Parliament glowing gold as a backdrop, whilst police pressed local drunks for identity cards, commuters stumbled into a cluster of floating smokey voices speaking from #jan25 Tahrir square, meanwhile a couple of live roaming readers searched live Tweets to read into the mix in Hungarian.. This trial outing in Budapest also served to plant the seed for next years Placcc Festival , where we hope to stage ‘The Speakers..” in a fully imbedded form for a Hungarian post-communist society vernacular. More to follow on this.. including some big thank you’s to the local Tweet ‘Speakers’, assistant Janak Csernak and support from StreamArts, Szovetseg39 and Placcc Festival. Commissioned and presented as part of the winter festival Fish & Chips III @ Atelier 231, Rouen, France (A ZEPA, INSITU & Meta Commission), on the anniversary of the uprising and revolution in Tahrir Square #jan25. • A physical & sonic manifestation of a network entity of revolution, as existent in the Twitter-Sphere. • Each suspended speaker (Rings) features a different voice, reading the Tweets from a different Tweeter, in thsi first verion, reporting from the revolution in Tahrir Square, Cairo. • Each speaker has a horn-like tail which illuminates and pulses with light, in response to the readers voice (so voices appear and dissapear in light around you). 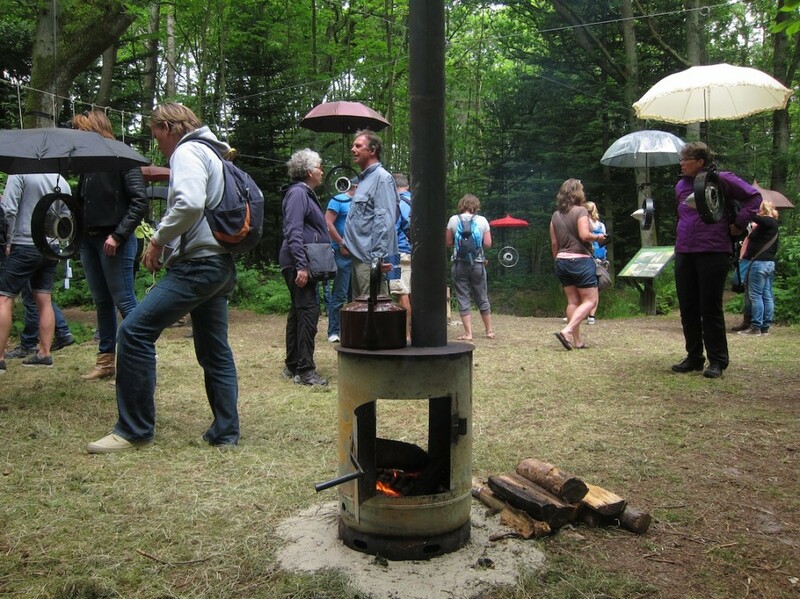 • Speakers gather around fires/stoves, with the most ‘followed’ and prolific Tweeters, closest to the fire. i.e. 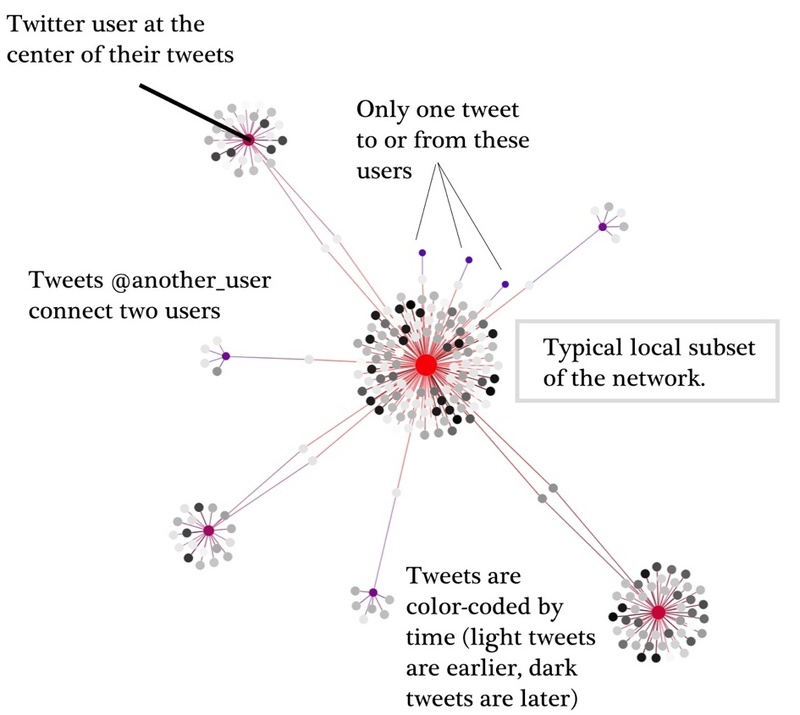 The speakers closest to the fire speak regularly (featuring a highly followed bloggers), those further out from the fire speak less frequently (and are less followed on Twitter). 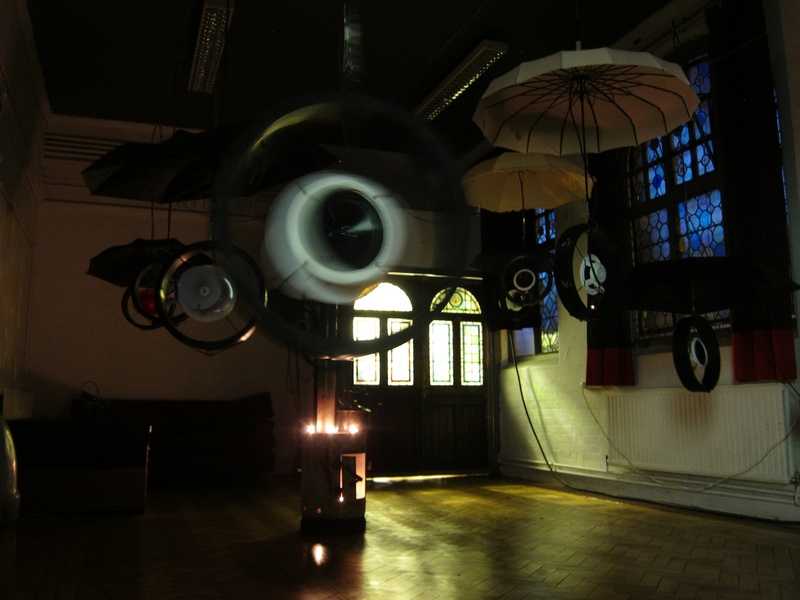 Sound and Installation Artist Thor McIntyre (of Aswarm) is working on a physical & sonic manifestation of the network entity of revolution, residing in the Twitter-sphere. 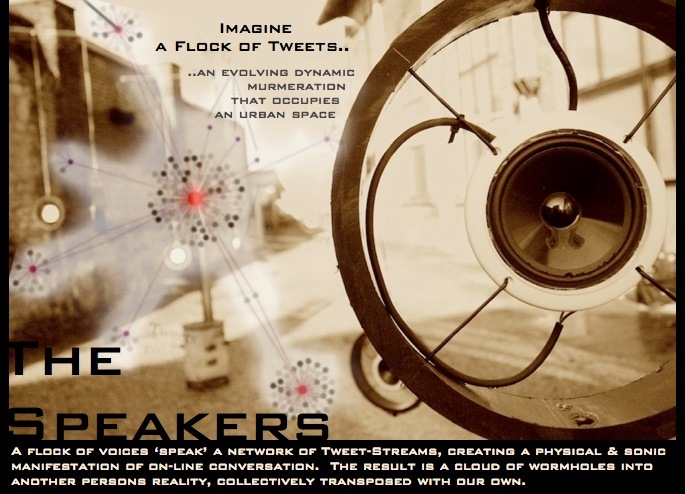 Flocks of suspended speaker cones (30+) gather around fires (stoves burning wood & coal), each speaker carries a different voice, reading the tweets of a different tweeter, providing a murmeration of voices. 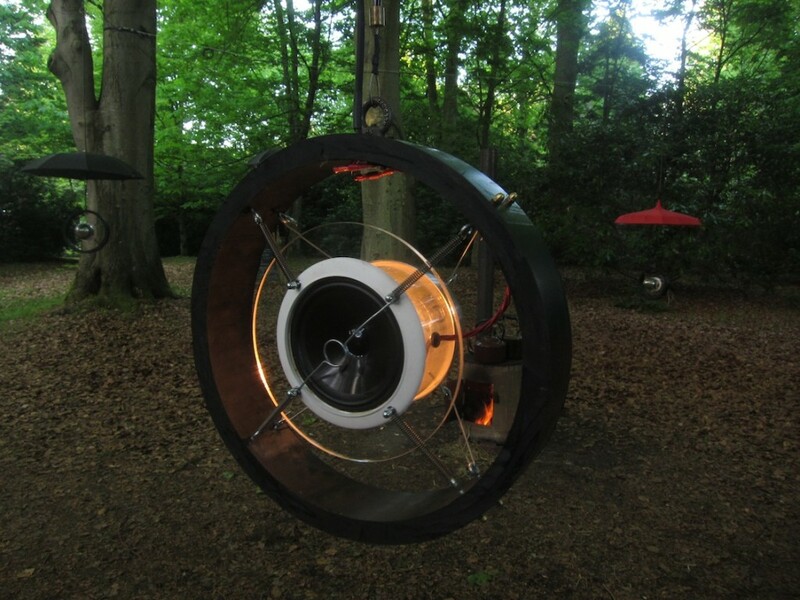 The inner circle of these speakers consistently chatter key tweeters in the field, whilst those further out from the fire, offer less frequent (or followed) bursts of tweets. The installation focuses on tweets written from people in the street, on mobiles in the harsh and very REAL reality of REVOLUTION. Boiling Point aims to return these ‘voices’ from the plastic reality of Twitter, back into real voices in the physical reality of the street, gathered around real burning fire. However in this new scenario these disembodied ‘voices’ are transposed into a different urban space, and are mediated through other unrelated people, a new entity the “reader”emerges. The aim is to offer an alternate way of interacting with this new form of disparate network entity. On the one hand the installation acts to disseminate the words & reality of its authors to new audiences and to catalyse discussion about their cause, and on the other hand it examines where these voices exist and quiet how they are mediated and appropriated. 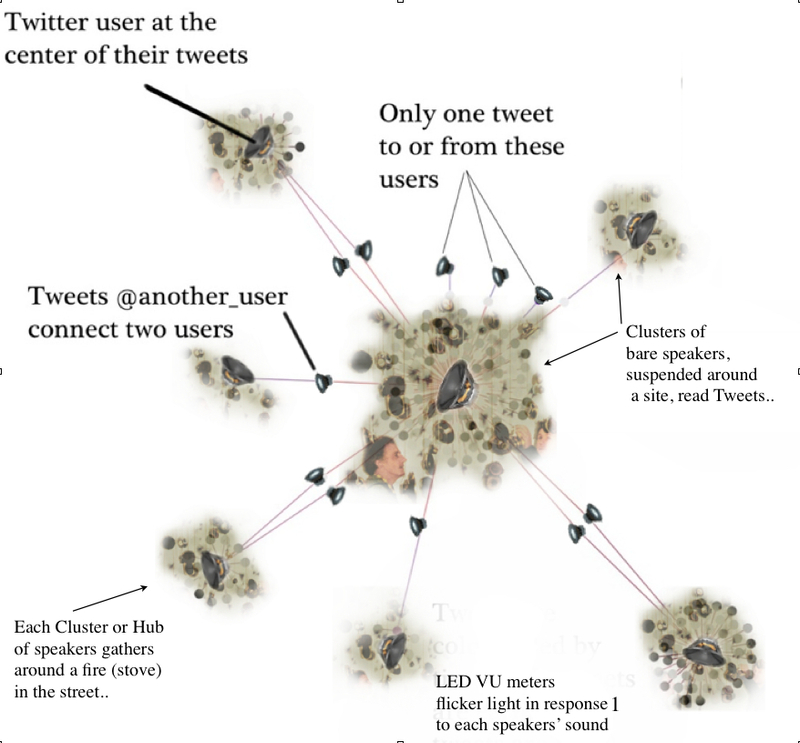 The Spatial Layout of the Speakers and Fires emulates some of hte network data analysis diagrams, created to demostrate the Twitter network. Real fires provide an epicentre for local network subsets, or clusters of conversation & interest, on line. Focus: Egypt’s Revolution of #Jan25 in #Tahrir square then and a year on. Focus: Twitters land mark U-turn decision to sanction censorship of its service (for the first time in its history!). -And so reverse the very reason Twitter was used to help organise this emblematic revolution in the first place..
Boiling Point V1 @ Fish & Chips #3 Festival (Jan 25-27th 2012), l’Atelier 231. As an INSITU & META supported artist in residence @Atelier231, Sotteville-lès-Rouen (FR) (One of Frances leading creation centres). In this first prototype rendition of the idea, the installation concentrates on voices reading tweets generated during the revolution in Cairo’s Tahrir square* #Jan25, and interlacing these with the more recent uprisings and elections in Egypt since the fall of Mubarak. This commission also draws on the historic context of Atelier 231, originally manufacturer of Boilers for the Pacific 231 Steam Locomotive. It was here in Rouen that the Train Network of the continent grew forth, revolutionising our concept of time & space. Given this context & the timing on the anniversary of todays most emblematic example of the new virtual Network Revolution, the Egyptian Revolution of Tahrir Square #Jan25, it seemed very prescient to set Boiling Point V1 here and now. • Develop capacity for Livestreaming of tweets, voiced via a cloud network of ‘Readers’, so we can track and follow live events and subjects pertenatnt to the exhibition location, community and language. • Investigate adding a new contextual layer via live brroadcast Audio Desciption (AD is the service to offer Blind viewers a description of televion). • Develop an installation model which can tour and easily adapt to different sites & scenarios. 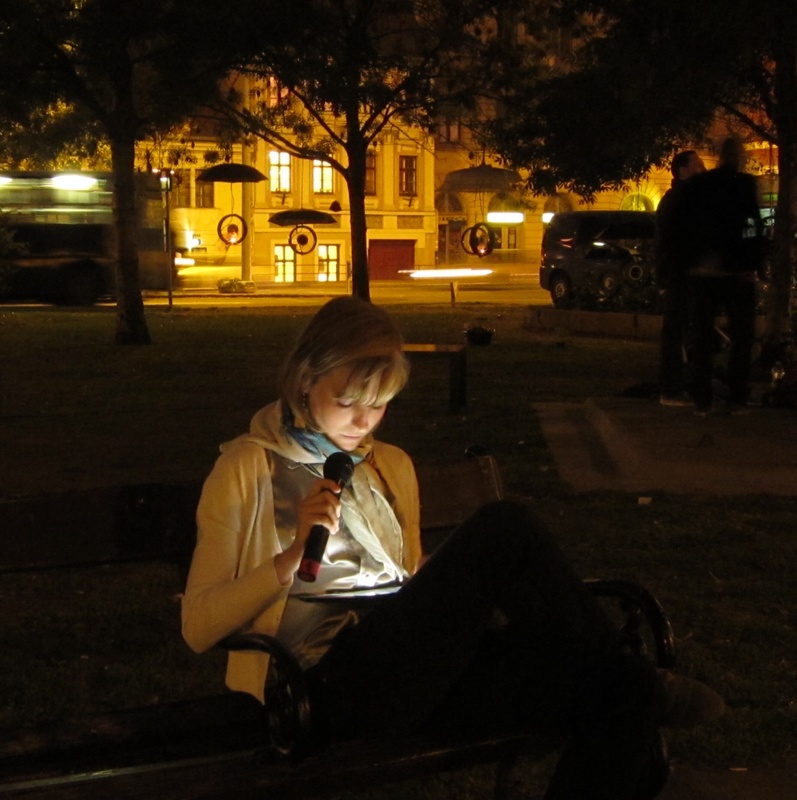 The initial version of the project @ Atelier 231, uses solely pre-recorded voices, speaking from Tahrir, however the longer term aim of the project is to develop a mix of pre-recorded and live streaming feeds, utilising a network of “Readers”, to give voice to the text as it is published live on line. By following key hash-tags and authors, the installation can offer a means of tracking events and discussion live. The work will focus around voices of dissent and reportage from people in very REAL and ALIVE scenarios (i.e. revolution), whilst also exploring questions of authorship, authenticity & censorship ( esp. since Twitters recent U-turn decision to sanction censorship of its service). Boiling Point has a confirmed commission for 2013 and has been awarded a Writing & Mobility Grant aid from IN-SITU (http://www.in-situ.info/fr/), in the framework of the project META to develop the work over 2012, and we are actively looking for partnerships with related Academic Research Centres and Cultural Institutions to develop the concept in a wider context of research and across borders. 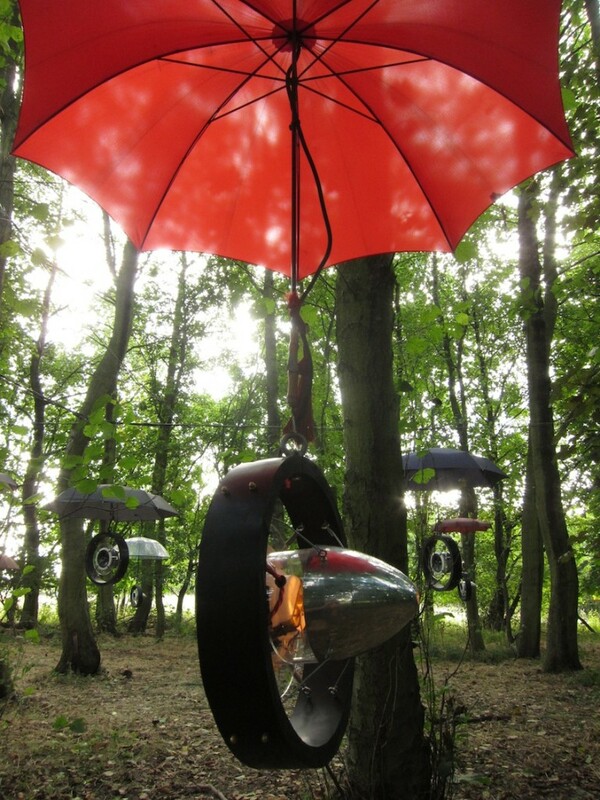 The project has been awarded R&D grant from With Out Walls (a consortium of British Arts Festivals) – for summer 2012 . Developing the concept, to incl: Live streaming and Audio Description, AV design, touring design potential and find research partners . – Mike Martins (Norfolk & Norwich Festival) proposed Thor & the project to INSITU for the “Writing side by side ”seminar held in Graz, Austria (AT)** in Nov 2011, (where 18 European artists were awarded writing aid packages to contribute to the development of their projects ). * With the support of the IN SITU network, European network for the artistic creation in public space, in the frame of the META project. 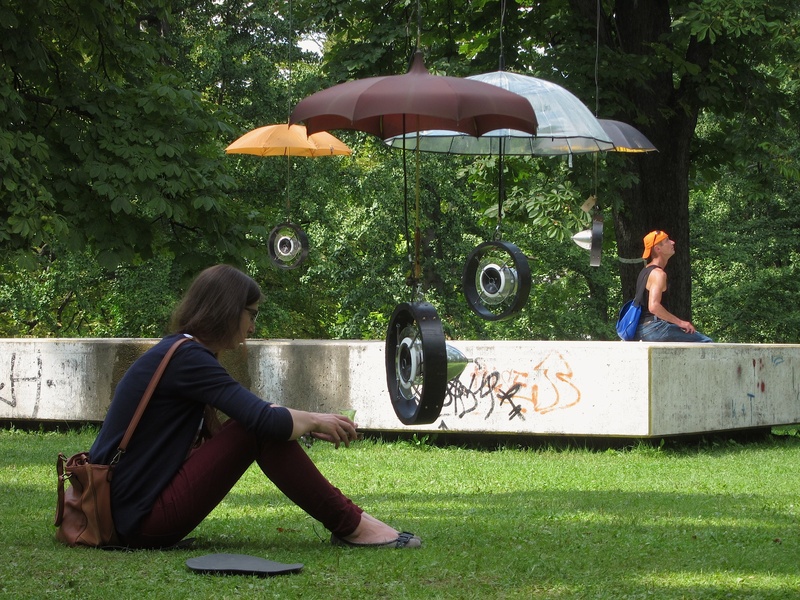 This project has received a Mobility Aid and a Writing Aid by the IN SITU* network, European network for the artistic creation in public space, in the frame of the META project. 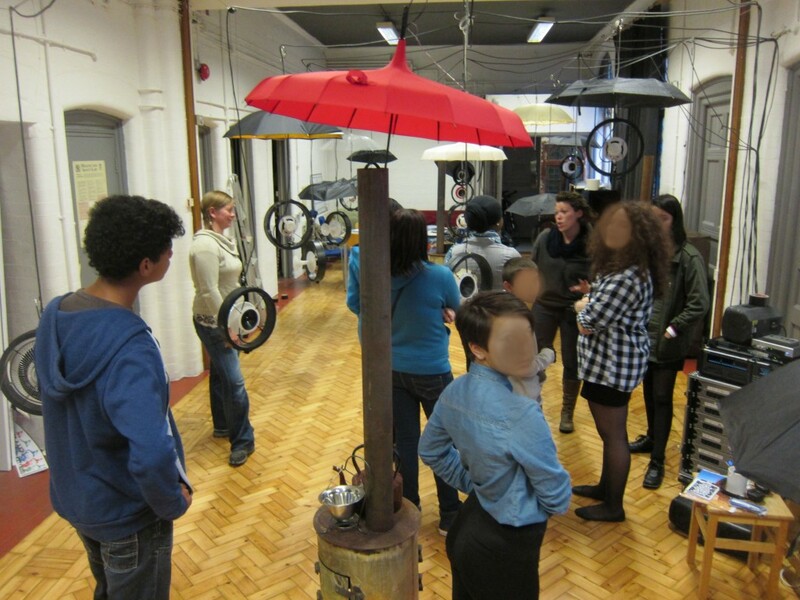 This project has been funded with support from the European Commission (DGEAC -Culture programme). Boiling Point v1 (Current aswarm project). IN SITU & META (EU) commission for Atelier 231, Rouen, France, as part of Fish & Chips #3. Also awarded Writing Aid grant to develop project over 2012. -A 48 channel Sound & light Installation. 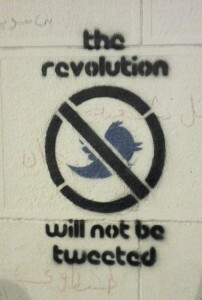 -A voiced manifestation of revolution drawn from Twitter. Some of the Tweets used in this version were drawn from the fantastic publication “Tweets from Tahrir“, edited by Nadia Idle and Alex Nunns, whose support in this endeavour, we are extremely grateful for. The book offers a linear collection of posts from key activists in the 18 days of Egypt’s revolution in 2011, offering the story of the uprising told directly by people who were live within it. Published by OR Books (ebook & paperback). (www.orbooks.com ISBN:978-1-935928-45-4). Aswarm & the creative production team. Although Thor was artistic director of this project it was created within the wider context of Aswarm and a team of fantastic diligent and generous people, whose sweat, blood and work helped enabled this beast to actually come about..
– Olly Aylmer: Collaborator soundscape & musical and installation rigger extra-ordinaire. – Giulio Ammendola: Creative & production assistant & collaborator (and Sepia Photographs above). – The Angels @ Atelier: – Technicians: Rictus “Tus” and Marko and PM Christophe Mouchere. Jeremy (Sound engineer) – Chris Day -master fire-tender.